A mid-range gaming PC without the price hike. 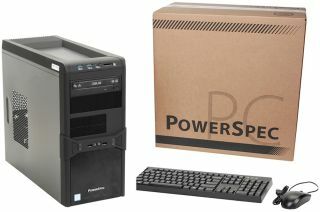 If you or someone you know happens to live near a Micro Center store, here's a heads up that it's currently offering a PowerSpec G151 desktop gaming PC with a GeForce GTX 1050 Ti graphics card on sale for $600. The system normally sells for $750. This is a Kaby Lake system featuring an Intel Core i5-7500 processor nestled into an ASRock B250-HDV motherboard. The CPU is flanked by 8GB of DDR4-2133 RAM and a 1TB hard drive. For the three of you still using optical media, you'll also find a 24X DVD writer. Perhaps more useful is 802.11ac Wi-Fi connectivity, along with a 400W power supply and Windows 10 Home 64-bit rounding out the spec sheet. We did a quick and dirty comparison on Newegg and found that the cost of parts add up to a little shy of $700, minus a case, keyboard, and mouse. With those accessories, you're probably looking at around $750 to build a similar system. Doing some price shopping and taking advantage of sales and mail-in-rebates could bring the cost down, but the bigger point here is that PowerSpec G151 is a decent buy at $600. You can check to see if your local Micro Center has any of these systems in stock by going here (the sale is valid for in-store pickup only).